I have wanted to try a Tom Ford lipstick for as long as I can remember. The only reason why I really wanted to try one was because of the stunning packaging and how stunning and chic they were. Plus, I thought that they would be a great addition to my flat lay photography. When I started to look into them a little more, I found the shade India Rose and it just screamed out to me that I needed it. After I first saw it, I was seeing that shade pretty much everywhere, it was on YouTube, Instagram, Pinterest and so many blogs. I think that was a sign telling me that it was about time that I went ahead and bought it. As much as I really wanted the Tom Ford Lipstick in India Rose, when I put it in my basket on the House of Fraser website, I kept chickening out because I just couldn’t bring myself to spend £40 on a lipstick. I have no issue spending my money on makeup, I am sure if you have visited my blog before, that will be quite obvious to you guys. But, £40 for a lipstick just seemed far too much money. I knew that the quality would probably be second to none, because I have tried other Tom Ford products before and they have all been beautiful, but I just couldn’t justify it. In the end I went ahead and bought it and let me tell you how happy I am that I finally just went for it and bought this lipstick. I love every single thing about it and that is why it has quickly become one of my most used makeup items and I have found myself reaching for it almost every single day. From the moment I received this in the mail it is obvious that it is an expensive and bougie item even from the outer packaging and it really did steal my heart. Now, I want a whole little army of these lipsticks just because they look so bloody lovely and they look so pretty sat on my vanity. I would say that this Tom Ford lipstick is a satin finish product. I wanted something that would feel nice and hydrating on my lips, especially with us moving into the colder months and because I tend to suffer with really bad chapped lips. I find that this keeps my lips looking really plump and healthy all day long because it sits so beautifully. I have tried other satin lipsticks in the past and none of them have felt quite as nice as this one does and that is why I have continued to use it over the past couple of months and I know that I will be using it well into the colder winter months. I also found that even though this is a satin lipstick, it has very good staying power. I used to opt for matte lipsticks because of the durability of them, but this one lasts very well thought-out the day. If I pop this on in a morning and go about my business including eating and drinking, I will need to top it up, but the product will not have completely disappeared from my lips or gone blotchy. Also, when I have a drink from a glass, it doesn’t leave a big noticeable mark like some other lipsticks can do. For the money, I am bloody glad that it has good staying power. The shade that I bought in Indian Rose colour is absolutely stunning. I would say that is very similar to the MAC Twig, which has been one of my favourite MAC lipsticks for a very long time and I like to keep one in my makeup collection at all times. And this on my tanned/olive skin tone is just like my lips but better colour. 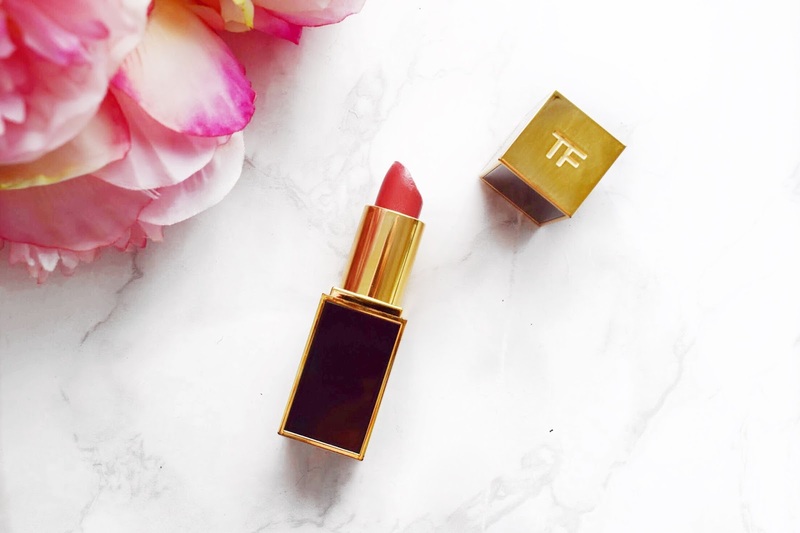 I think that it is safe to say that I have found a new favourite lipstick shade in this stunning Tom Ford colour and I know that it is going to be one of my go to lipsticks for a very long time indeed. For anybody out there that is thinking about trying out a Tom Ford lipstick, I would just say go for it. They are pricey, but I honestly think that they are worth every single penny and I am already planning on trying more of them out over the next couple of months. I will leave a link to some of my favourites down below in case you want to check them out for yourself. Make sure to leave me a comment and let me know if you have tried any Tom Ford lipsticks and what you thought about them. I haven't had the chance of trying out Tom Ford lipstick but this shade looks like my kind of colour! Added to my wishlist! You wont regret it if you do try the Tom Ford lipsticks, they are so lovely! Ah I've been wanting to try a Tom Ford lipstick for so long, they look amazing! This shade looks gorgeous. They are amazing, and if you aren't worried about splashing a little cash I would highly recommend them! I haven't tried any Tom Ford before and have to agree £40 is a lot for a lippie! it's a pretty colour though! It is a really nice colour, I have been loving it lately! this looks like such a beautiful colour! quite expensive though! I really had to gear myself up to spend that much money on a lipstick! It is a stunning colour, really nice for this time of the year! Oow thanks, I will check it out! This looks so nice but I wouldn't pay £40 for a lipstick, it's just too much for me! I get where your coming from with that! I really had to talk myself into buying this one!